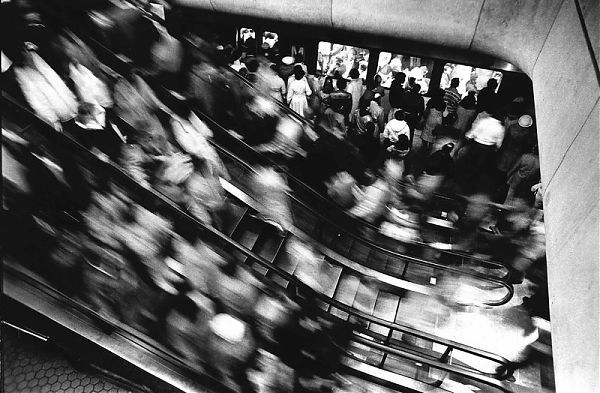 A rush of train riders during morning commute at Metro Center station. The Washington Post/Getty Images. “While we seek to resolve problems of moving people and goods within the congested National Capital area, our concerns must not be confined to the utilitarian requirements of transportation alone,” Johnson wrote to Walter J. McCarter, administrator of the National Capital Transportation Agency (NCTA, the forerunner of the Washington Metro Area Transit Authority (WMATA) on February 22, 1966. At a time when public opinion of East Coast subways has reached a low, it is worth revisiting this high: a subway grand tour, CFA minutes with design advice from architect Gordon Bunshaft and art critic Aline Saarinen, rejected graphic designs that are the opposite of Unimark’s low-key Helvetica.